Thanks to the very talented skills of Jodie Lombardo, I can share with you these fabulous fantasy reborn baby eyes. These eyes really are sensational. They are so pretty, which I know is a weird thing to say about eyes, but they really are. I can imagine these eyes on either a fantasy animal doll or a fantasy baby, they would make the end result something very very special. To be honest I can not wait to see the dolls created using these eyes. When I finally manage to own a fantasy baby, it will make me so happy, I think that I would actually want these eyes in the doll. There is just something about them that I really like. If you like them as much as I do then what you are going to want to know is where you can buy yours? 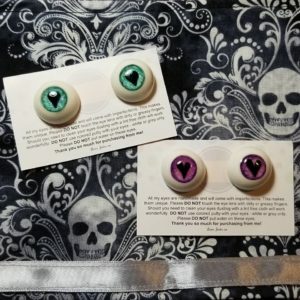 To buy your own fantasy eyes use the link provided below to be relocated to the Wicked and Sweet Dolls website.